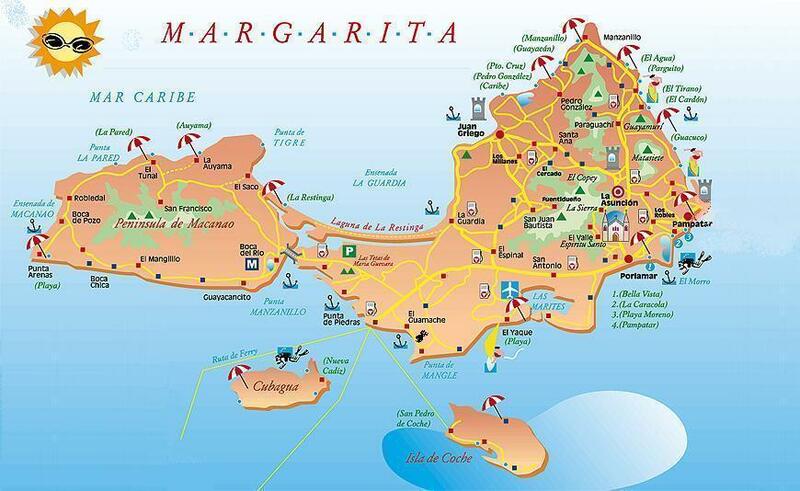 Margarita Island, 444 sq mi (1,150 sq km), in the Caribbean Sea off the coast of Venezuela. With many smaller islands it constitutes the Venezuelan state of Nueva Esparta (1990 pop. 263,748). La Asunción is the capital; the economic center is Porlamar, where an important pearl-fishing industry exists. Other island industries produce canned fish, salt, fishing boats, ceramics, tiles, shoes, and sisal hats. The construction of a freshwater pipe from the mainland has spurred economic development, and Margarita has become a popular tourist resort. The island was sighted by Columbus in 1498 and was used (1561) as a base of operations by the Spanish adventurer Lope de Aguirre. Because the people supported Simón Bolívar, Margarita and its neighboring islands were made a state after independence was won from Spain.